Now available from Erect-A-Rack , RigiRack archive shelving is an ideal product for storage of standard sized archive boxes, documents and plans, that has specially designed shelf lengths to minimise any wasted storage space. Strong and sturdy, RigiRack archive shelving allows materials to be accessed from all four sides for quick and simple record retrieval. Erect-A-Rack archive shelving provides a cost effective storage system with rigid connections that provide solid support for decking. 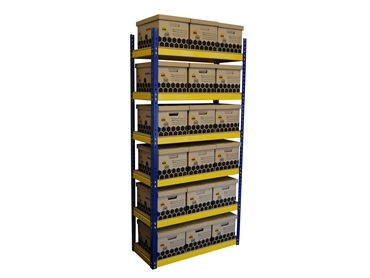 shelf levels designed to accommodate loads of up to 400kgs.